Donald Tusk, President of the European Council, is talking about Brexiteers going to hell. We had Guy Verhofstadt, top European diplomat and member of the European Parliament, saying that the devil would not let them in. As for British Prime Minister Theresa May’s all-important request (that the European Union could add a standard break clause to the Brexit deal), Martin Selmayr, chief of the EU civil service, had already announced that it was not even being considered. This is the strange world of Tusk’s inferno, and it’s worth exploring. In another, more logical world, a deal would have been done on the spot yesterday. The Dutch are dreading a no-deal Brexit, Calais port authorities are already seeing customers making alternative plans and the Irish are fretting about medicines imported through Britain. With a bit of goodwill, agreement could be reached with a single phone call, and millions of minds put at ease. So if Tusk’s objective is to agree a deal, his behaviour this week has been unfathomable. But to him, and to others in Brussels, there is far more at stake. There is more to Brexit than just a deal with Britain. The European Union is concerned about its survival, and is keen that other countries do not follow Britain out of the door. For understandable reasons (and ones that Brexiteers are wrong to downplay) Brussels needs the Brexit process to looks agonising. If Britain was able to agree a deal without much pain, then a few other nation states might get similar ideas. A few days ago, a poll in France showed support for Frexit now stands at 40 per cent. The EU’s own research shows that Austria, Greece and Italy are even unhappier with EU membership than Brits. Euro-sceptic parties are on the rise across the continent and will likely do well in the coming Euro elections. Realistically, these upstarts want to stay, and change Europe, rather than leave it. But when Tusk and his allies look at Brexit, they see a version of the spectre haunting them at home. Understandably, they attack. Tusk’s language about Eurosceptics roasting in hell is aimed at Eurosceptics everywhere. It also helps give a show of strength, at a time when EU unity is creaking. France recently took the extraordinary step of recalling its ambassador to Italy — as close as you can get to breaking off diplomatic relations — in a squabble about Italian support for the gilets jaunes protesters. To French President Emmanuel Macron, this is not so much about globalism vs nationalism, but about good vs evil. The Italians, he thinks, have gone for the latter option. And if we think Tusk’s Dante jokes are undiplomatic, then consider the oeuvre of Matteo Salvini, Italy’s Deputy Prime Minister, who has been encouraging the French to “free themselves of a terrible president”. All of this could get worse. 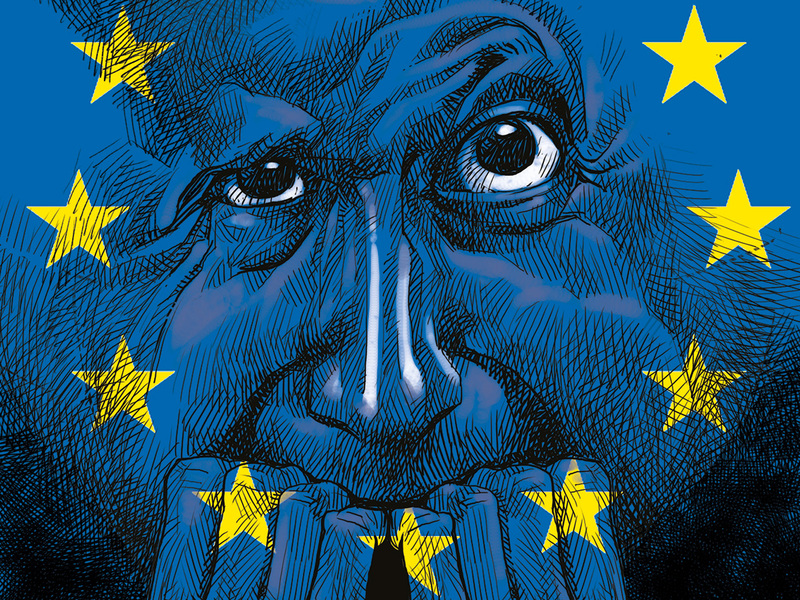 As Macron knows, it won’t be long before the likes of Salvini and Viktor Orban, the prime minister of Hungary, will be appointing their own European Commissioners — and his battle against the Eurosceptics comes a lot closer to home. If things were going better for the EU, it might not be so worried about granting Britain a decent deal. But its project, of an ever-closer union, is in crisis and could be halted by the May elections. The German economy is stuttering, with fairly disastrous industrial figures. The Eurozone was recently given an economic downgrade just as dramatic as that administered to the United Kingdom by the Bank of England. But Brexit talks allow the EU to stand as a coherent, strong and united force. Phrases like “we, the 27” are dropped into various Brexit speeches, to hammer home the point of unity, of Britain versus the rest. And to Jean-Claude Juncker’s credit, he has kept remarkable discipline. The focus on Ireland also has wider uses. Leo Varadkar, the Taoiseach or prime minister, likes to talk about how Brussels helps not just Ireland but all small member states. Given how many millions in smaller countries were hurt by the Eurozone crisis, the EU certainly does have some making-up to do. And, of course, it was naive to expect that the Brexit process was going to be anything other than agonising. This is a divorce: such proceedings are emotional and seldom short of drama. The EU is not really keen on Britain running off with a new trade partner, which is why Jeremy Corbyn’s plan for a customs union may well appeal. And why the EU may well keep playing for time to see if May would take up his offer. If the Tories are split in the process, so much the better. Even if May’s deal is approved, we ought not to expect relations to get much better. The best response, of course, is for May to repeat what she once said in Florence (and doesn’t say enough): That Britain seeks to be the EU’s strongest friend and partner, its closest and most powerful ally. That Brexit is not about leaving Europe, but finding better ways to work with its neighbours. It might not seem that way in many of the continent’s capitals, but that’s all the more reason for the UK to make the case now. Fraser Nelson is editor of the Spectator and a noted columnist.